The 330 GT was introduced as a replacement for the 250 GTE which had been Ferrari’s first series production model to offer a four-seat cockpit arrangement. Produced alongside the sultry 275 GTB and exclusive 500 Superfast; the 330 GT was designed as a more comfortable and less demanding vehicle to drive. The Tipo 571 chassis frame was in many ways a close development of the frame used for the outgoing 250 GTE. A number of important revisions were made including a 50mm wheelbase extension and the inclusion of adjustable Koni shock absorbers. The Tipo 209 V12 engine was developed from the enormously impressive Colombo line that dated back to 1947; the 330 GT engine has a displacement of 3967cc which helped equate to a very healthy 300bhp at 6600rpm, enough to propel the 330 GT from zero to sixty in just 6.3 seconds and onto a top speed of 150mph.The provisional 330 America was replaced in January 1964 by the new 330 GT 2+2. It was first shown at the Brussels Show, and was much more than a re-engined 250; however, with a sharper nose and tail, quad headlights, and a wide grille. The wheelbase was 50 mm (2.0 in) longer, but Koni adjustable shock absorbers improved handling. A dual-circuit Dunlop braking system was used with discs all around, though it separated brakes front to back rather than diagonally as on modern systems. Our car # 6125 with correct matching numbers is presented in Blu Scuro Metallizzato with Pelle Rosso interior. Production completed in July 1965 and from information received the car was supplied new to Gosta Sverdrup. The second owner Bertil Persson of Saltsjöbaden, Sweden acquired the Ferrari in 1967 at 25,222 km and maintained a complete detailed dossier of his ownership up until 1979. We understand that at this juncture Mr Persson placed the car in storage until 2007. From information provided, we believe that Mr Persson then sold the motorcar via Classic Garage AB to Mr Brian Aitken in Scotland where the “No Expense Spared” total restoration commenced. Our nominated Ferrari Service Centre has just completed a full service & safety check, the car is now ready to use & enjoy! This is a rare opportunity to acquire one of only 424 cars produced with the correct matching numbers. 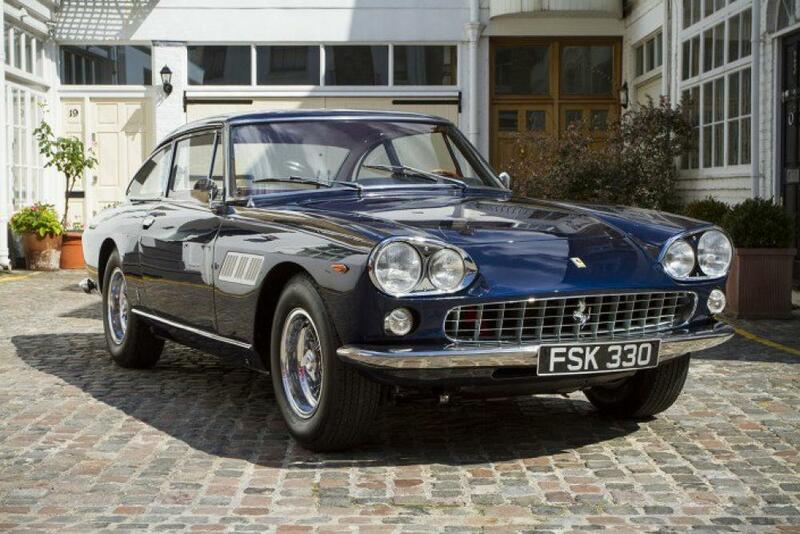 This 330GT 2+2 is presented in concours condition throughout and represents exceptional value in today’s marketplace for these highly collectable V12 Colombo engine coupés.